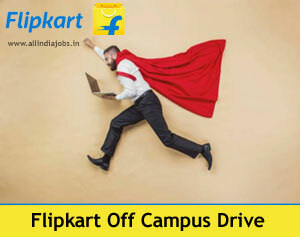 Flipkart Off Campus 2018 Drive. Are you interested to begin your career in Flipkart? Candidates can apply for the latest jobs in Flipkart through All India Jobs. Interested aspirants search & apply for the latest Flipkart jobs for freshers & graduates. Flipkart is one of the Top eCommerce site in India. It is purely based on Online shopping site. It is most reputed company and everyone has admired of a job at Flipkart. Candidates who are willing to get placed in Flipkart must utilize this excellent chance. Flipkart is hiring the freshers for specific positions of entry level engineers and IT internship jobs. Go through complete details of Flipkart current openings and vacancies in this post. At First, Candidates has to register with all necessary details to apply for specific Post or designation. Below, we have provided the registration link get registered and visit our page for regular updates related to Flipkart recruitment notification. Candidates willing to appear in the Flipkart Off Campus 2018 Freshers Recruitment Drive are required to register online and must carry the copy of mandatory documents which are mentioned by the Flipkart. We have also gathered latest Flipkart Placement Papers and Flipkart Test Pattern for better preparation. We always try to post all the current vacancies across India with all the job details. If any candidate have any problem then they can contact us through our mail and we will try to respond you guys as soon as possible. All India Jobs have the aim to show you the right path so that you can get your dream job as early as possible. Engineering students who had passed in the year 2018 and 2017 are eligible to apply. BE / B.Tech / ME / M.Tech in any Disciplines (CSE, ECE, EEE, IT, Civil, Mechanical etc). Must have Very good logical skills. Good project management skills, self-initiated. Two wheeler license and vehicle. Must have 60% and above in all academic courses from 10th standard onwards. In case you have done both, 12th and equivalent diploma, you should have secured minimum 60% aggregate marks in both courses. No pending backlogs at the time of appearing for the Flipkart Selection process. It is mandatory to each and every employee. After applying the Flipkart vacancies the company conducts a written test to get the shortlisted of candidates. After the written exam and Trade Test Flipkart conducts the interview to select the candidates based on his knowledge. The Flipkart offers a pay scale to its employees according to the post they are recruited in. Basic pay scale in Flipkart is Best in the Industry with attractive amount perks as per experience and slab in Flipkart. Click on Apply Here link which are provided below. Fill your academic qualification, skills, experience and other related information as per the instructions. Complete the Flipkart Application Form with the essential data. Check the Details before submitting the application form. Must carry one hard copy of mark sheets, Latest resume, 3-4 Passport size photographs (recent) and Photo ID Card (Driving License/ Passport/ Voter ID/ College ID). Candidates are required to carry their all qualification documents from SSC. (Original copy and 1 photocopy of each). A person, who is flexible to accept changes as per business requirement would be an added advantage. Practice Flipkart Placement Papers and Syllabus. Practice Top 10 HR Interview Questions. Have a look on Flipkart Test Pattern and refer it before going to interview. Be confident and make an eye contact at the time of HR Round. Candidates who want to attain other related details regarding Flipkart Off Campus 2018 by visiting official site that is well stated here by the team of All India Jobs. For more latest job updates contenders can visit our site frequently and bookmark this page www.allindiajobs.in.